Keratoconus is a medical condition that causes the cornea to bulge outward. The cornea is the clear, dome-like structure on the front part of the eye. Over time, the cornea becomes steeper and steeper. Keratoconus is a Greek word meaning "cone-shaped cornea." With the condition, the cornea becomes cone-shaped, and vision becomes extremely distorted and blurred. Keratoconus tends to start to show up in the teenage years and levels off after the age of 40. People may not even know they have it in the early stages. Although keratoconus always seems to be worse in one eye, it is usually a condition that occurs in both eyes. When keratoconus progresses, vision becomes very blurry and distorted. Vision worsens because as the cornea bulges forward, irregular astigmatism and nearsightedness develop. As the condition progresses, corneal scarring may occur, causing further vision loss. Some patients with keratoconus notice vision fluctuating frequently while others only see changes over a period of years. People with keratoconus often complain that vision is not improved much with corrected eyeglasses. In some cases, the cornea can bulge forward and become so thin that scarring develops, further impeding vision. In rare cases, the cornea can decompensate, causing severely reduced vision or even blindness. The exact cause of keratoconus is a bit of a mystery. However, scientists believe that genetics, the environment, and hormones may influence why some people develop keratoconus. Genetics: It is thought that some people have a genetic defect that causes certain protein fibers in the cornea to become weak. These fibers act to hold the cornea together maintaining its clear, dome-like structure. When these fibers become weak, the cornea begins to bulge forward. Some scientists believe that genetics play a strong role in keratoconus because, occasionally, a relative will also develop keratoconus. Environment: People with keratoconus tend to have allergies, specifically atopic allergic diseases such as hay fever, asthma, eczema, and food allergies. Interestingly, many patients that develop keratoconus have a history of vigorous eye rubbing. Some of these people have allergies and some don’t, but they tend to rub their eyes. It is thought that this vigorous eye rubbing can cause damage to the cornea, causing keratoconus to develop. Another very popular theory about what causes keratoconus is oxidative stress. For some reason, people that develop keratoconus have a decrease in antioxidants within the cornea. When the cornea does not have enough antioxidants, the collagen within the cornea becomes weak and the cornea begins to bulge forward. Oxidative stress can be caused by mechanical factors such as eye rubbing or in some cases, excessive ultraviolet exposure. Hormonal causes: Because of the age of onset of keratoconus, it is thought that hormones may play a large role in its development. It is common for keratoconus to develop after puberty. It has also been documented to advance or progress in pregnant women. Oftentimes, people with early keratoconus first develop astigmatism. Astigmatism is caused by the cornea having an oblong shape, like a football, instead of a spherical shape, like a basketball. A cornea with astigmatism has two curves, one flat curve, and one that is steep. This causes images to appear distorted in addition to appearing blurry. 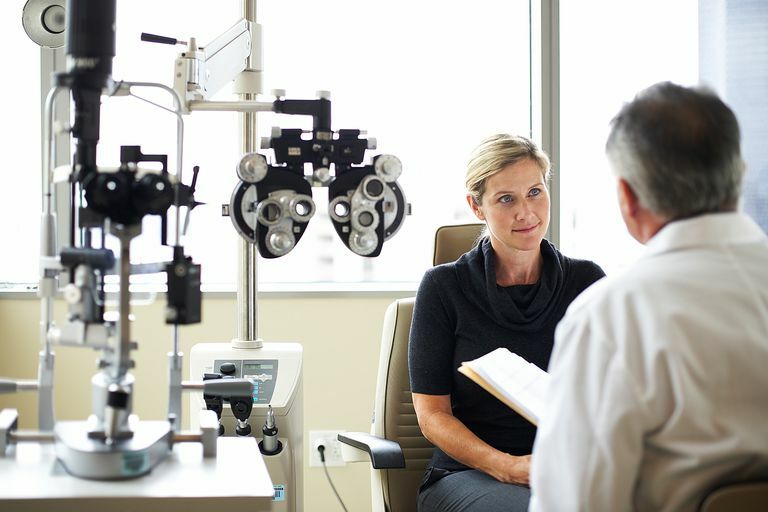 However, these patients tend to come back into their optometrist’s office a little more frequently, complaining that their vision seems to have changed. Because the cornea gradually becomes steeper, nearsightedness is also frequently diagnosed. Nearsightedness causes objects to become blurry at a distance. Eye doctors measure the steepness of the cornea with a keratometer. He or she may notice a gradual steepening over time, and corneal topography testing will be ordered. A corneal topographer is a computerized method of mapping the shape and steepness of the cornea. A corneal topographer produces a color map that shows steeper areas in hotter, red colors and flatter areas in cooler, blue colors. Topography will typically show an inferior steepening of the cornea. Sometimes topography will also show an asymmetry in shape between the top half of the cornea and the bottom half of the cornea. Along with a comprehensive eye examination, eye doctors will also perform a slit lamp examination using a special upright bio-microscope to examine the cornea. Oftentimes, keratoconus patients will have fine lines in their cornea called Vogt’s striae. Also, a circle of iron deposition around the cornea may be visible. There are several ways to treat keratoconus depending on the severity of the condition. Soft astigmatism contact lenses: In the early stages of keratoconus, a soft toric lens may be worn. A toric lens is a lens that corrects astigmatism. The lens is soft, but it contains two powers: one power and also different power 90 degrees away. Rigid gas permeable contact lenses: In moderate stages of keratoconus, a rigid gas permeable lens is worn. A rigid gas permeable lens provides a hard surface, so that any corneal distortion may be covered up. As keratoconus advances, it may become more difficult to wear a rigid gas permeable lens because of excessive lens movement and decentration of the lens. Rigid gas permeable lenses are small lenses, usually around 8-10 millimeters in diameter and move slightly with the eyelid blink. Hybrid contact lenses: Hybrid contact lenses have a central lens made out of rigid gas permeable material with a surrounding soft skirt. This provides much better comfort for the person wearing the lens. Because the center is rigid, it still delivers the same vision correction as a regular rigid gas permeable lens. Scleral contact lenses: Scleral contact lenses are very large lenses that are made of a material similar to what rigid gas permeable lenses are made of. However, scleral lenses are very large and cover the cornea and overlap onto the sclera, the white part of the eye. A scleral lens completely vaults the steepest part of the cornea, increasing comfort and reducing the chances of scarring. Corneal cross-linking: Corneal cross-linking is a relatively new procedure that acts to strengthen the bonds in the cornea to help retain its normal shape. The procedure involves applying riboflavin (vitamin B) to the eye in a liquid form. An ultraviolet light is then applied to the eye to solidify the process. Corneal cross-linking typically does not cure keratoconus or reduce the steepening of the cornea, but it prevents it from worsening. Penetrating keratoplasty: Rarely, keratoconus may worsen to the point where a corneal transplant is needed. During a penetrating keratoplasty procedure, donor cornea is grafted onto the peripheral part of the recipient’s cornea. Newer laser procedures have increased the success of a corneal transplant. Typically, corneal transplants are successful. However, rejection is always a concern. It is difficult to predict the final outcome of a patient’s vision. Although the transplant may be successful, the patient may still end up with a fairly high prescription and the need for wearing glasses. Boyd, Kierstan. What Is Keratoconus? American Association of Ophthalmology (AAO), 1 Sept 2017.